PASS Packs simplify adherence for patients and caregivers, giving them the confidence to take control of medication compliance. The easy-to-read packs clearly state the medication, dose, and time of administration. They no longer wonder when the next dose is due or if they took their morning meds. We Now Have a Low Cost Generic to Viagra! Introducing a revolutionary approach to managing multiple medications! 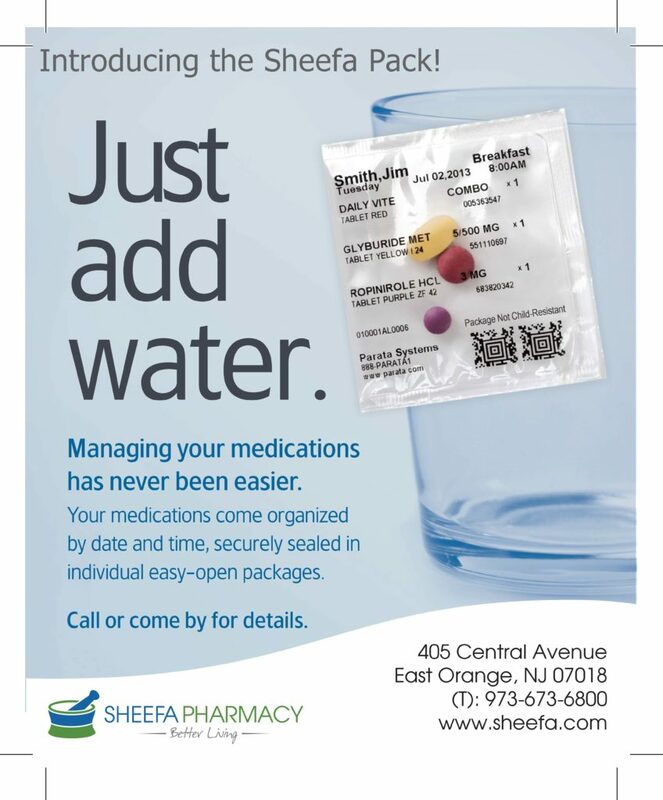 East Orange, NJ (September 4, 2015) – Sheefa Pharmacy & Wellness Center is pleased to announce that it now offers a customized packaging solution to help its customers take the right medications, at the right time, every time. By implementing the Parata Patient Adherence Strip System (Parata PASS™), the pharmacy offers increased confidence, convenience and safety by pre-sorting multiple prescriptions into a single package for the specified time of day. It’s easier for caregivers to administer, and easier for seniors to adhere to complex medication regimens, both of which are essential to extending independence and health. Sheefa Pharmacy prepares each customer’s medications in a sealed, clear, plastic packet, called a SheefaPACK™, which is arthritic-approved for easy opening. Each SheefaPACK is custom-printed with the customer’s name; day and time of dose; medication names, strengths and descriptions; and other details. East Orange, NJ, Sheefa Pharmacy & Wellness Center proudly announces its achievement of PCAB accreditation, a service of ACHC, for our compounding services. The accreditation is awarded in recognition of the pharmacy’s commitment to meeting and/or exceeding national quality standards. Compounding medications is an integral part of the practice of pharmacy and the demand for these customized medications increases every year. Welcome to Sheefa Pharmacy’s New Blog! 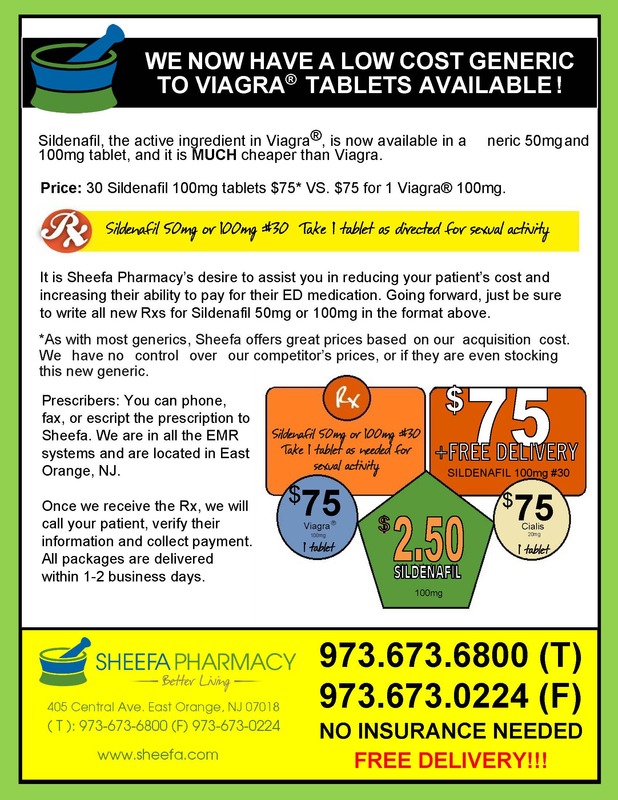 Welcome to our blog and thank you for choosing Sheefa as your friendly neighborhood pharmacy! Your commitment as a customer is very much appreciated. We will do our best to meet and exceed your expectations in fulfilling and accommodating your health needs. – We’re only 1 of 6 Pharmacies in New Jersey, and the only pharmacy in Essex County that is accredited to do personalized prescription compounding? – We were inducted into the 2009 Jewel of the Community Hall of Fame in the City of East Orange? – We have a certified trained Smoking Cessation Specialist on staff? We value your patronage and look forward to serving for many years to come. Please do not hesitate to call if you need to speak to the Pharmacist regarding your medications or any health concerns you may have.